Video analytics have a far-reaching and extensive impact. Based on artificial intelligence and machine learning techniques, Video Content Analytics helps law enforcement accelerate investigations, increase situational awareness and uncover behavioral trends over time. Ultimately, this empowers government and police agencies to maximize the value of their video and investments in surveillance infrastructure. Beyond everyday uses, such as optimizing traffic flows, security coverage and investigation efficiency, video analytics help law enforcement overcome otherwise insurmountable challenges. Here are three cases where video analytics technology was a key enabler in law enforcement and security teams’ solving a crime and how this tool extended the value of video beyond its typical scope. When the Hartford Police had to investigate a fatal shooting at a local nightclub, they found themselves with very little evidence to direct their investigation: All they had was witness accounts of the suspect and the getaway vehicle. Using Video Content Analytics, law enforcement could review hours of footage from the days prior to the incident and identify vehicles similar to the one described by witnesses. This enabled the police to successfully isolate matching cars and identify the suspect’s vehicle in footage recorded at a red-light hours before the crime was perpetrated. By zooming in, the police could see that the driver’s face matched the suspect description. Subsequently, they were able to secure a search warrant, swab the suspect for DNA and confirm a DNA match based on crime scene evidence. The ability to rapidly search hours of video across multiple cameras and filter out extraneous video objects enabled the police to pinpoint the person-of-interest efficiently and accelerate their investigation. Sometimes VCA technology can detect anomalies and abnormal behaviors that would be otherwise undetectable to the human eye. Whereas a security officer in a control room monitoring surveillance feeds may not be able to identify a shadow or reflection of an object, a video analytics solution can be configured to varying levels of detection sensitivity. When set to the highest degree of detection sensitivity, a video analytics engine even could identify a perpetrator’s reflection and extract it as a video object. Video analytics has been successfully leveraged to solve cases where criminals were outside the surveillance range, by matching a reflection of a suspect to witness descriptions of that suspect. By logging this video evidence, law enforcers were able to prove the presence of the suspect at the scene of the crime. Part of every post-event investigation is understanding why the crime occurred and what steps could have been taken to prevent the incident. In the aftermath of a terror attack in a major city, law enforcement wanted to understand how the terrorist arrived to perpetrate the attack. By uncovering how the perpetrator reached the scene of the crime, the police hoped to learn how to secure against future attacks. Searching for the perpetrator’s attributes across multiple cameras in various locations at different times, the police were able to isolate suspect appearances in cameras stationed around public transport hubs. Investigating with video analytics capabilities, the police concluded that the perpetrator arrived at the scene of the crime using public transportation, providing key insight into gaps in security in the local public transportation and transit system. Based on this intelligence, law enforcement was able to accelerate the criminal investigation and derive valuable insight to increase security and prevent future attacks. These three examples demonstrate the power of video analytics for law enforcement, but they are just the tip of the iceberg! 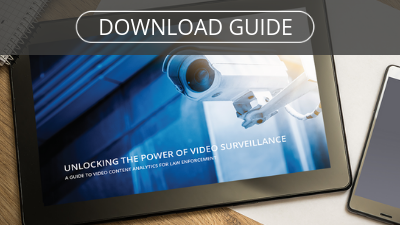 Discover more ways Video Content Analytics are driving investigative and operational efficiency for law enforcement in BriefCam’s Guide to Video Content Analytics for Law Enforcement.